Even as we see our government and our leaders try to solve our problems, it’s clear that we cannot rely on them to solve our spiritual problems. Instead, when we as a civilization open ourselves up to God’s love, he will pour a new anointing of His Spirit upon us. Our plan must be to establish the kingship of Jesus over all of civilization. Jesus must rule over every human heart and institution, in every government and nation all over this world. From the Heart of Jesus, who shed His blood for us, God’s love will flow. It was at the Visitation Convent in Paray-le-Monial, France, during apparitions that occurred between 1673 -1675, that Christ appeared to then Sister Margaret Mary (1647-1690) and revealed His Sacred Heart. When Jesus appeared he came out from the tabernacle, showing that he it truly present in the Blessed Sacrament and that he is not some remote and impersonal God. At that time, Jesus revealed His very heart surrounded by flames to show his burning love for all of mankind every moment of our lives. Above his heart is a cross, the cross on which he died for us. This image of Jesus tells us that He loves us so much that he would even die for each one of us. When someone will die for you, that is a tremendous gift. Also in his heart is a wound. This is from his enemies—all those who hate Jesus. In a vision, which took place on June 16, 1675, Christ asked St. Margaret Mary to request that the Feast of the Sacred Heart be celebrated in reparation for the ingratitude of men for the sacrifice that Christ had made for them. The devotion became quite popular after St. Margaret Mary’s death in 1690, but it was not until almost 100 years later, in 1856, that Pope Pius IX extended the feast to the universal Church. That feast is celebrated on the day requested by our Lord—the Friday after the octave the feast of Corpus Christi. 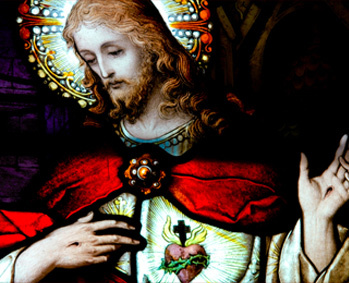 The idea of enthronement comes from the promise Our Lord Jesus made to St. Margaret Mary in one of the visions: “I will bless every house in which an image of My heart shall be exposed and honored.” When we do expose an image of the Sacred Heart of Jesus, we put Jesus over us in a visible as well as a spiritual way. Through this act, we publicly proclaim our allegiance to the Sacred Heart of Jesus, placing our families, schools, churches, dioceses, cities, and countries under His divine protection and guidance. Father Mateo Crawley-Boevey, born in Peru on September 18, 1875, began the tradition of publicly enthroning the Sacred Heart. At sixteen, he joined the Congregation of the Sacred Hearts of Jesus and Mary in Valparaiso, Chile, and applied himself with zeal to promoting devotion to the Sacred Heart. Through his desire to spread the promises of the Sacred Heart to the world, and wanting to draw families closer to Jesus, the King of Love, he began placing the image of the Sacred Heart in a place of honor in as many homes as possible in order to foster bringing each family’s life into intimate relations with the Sacred Heart. On August 24, 1907, Father Mateo drew up his plan “to conquer the whole world for the Heart of Jesus, home after home, family after family.” Each of the five Popes who reigned during the life of Father Mateo gave full blessing to the work: St. Pius X, Benedict XV, Pius XI, Pius XII, and John XXIII. This is the time for renewal of Father Mateo Crawley-Boevey’s ministry. This recognition of the Kingship of the Heart of Christ over us is not reserved just for families, but is open to individuals, parishes, dioceses, and institutions. The Enthronement is really a way of life. The Divine Heart of Jesus is the center of attention attracting families and communities to live under the influence of his love and not to fret about the state of affairs in any given situation. When we make a covenant with the Sacred Heart of Jesus to live under his kingship, we need not fear for we have the protection of the King of the World. We thereby accept his lordship over our families and over the world. From that place of protection, we can move forward. We need fear nothing. Mother Teresa is a person who understood this plan. When she asked permission to bring her sisters into third world countries, the leaders would ask her what she wanted to do. Mother Teresa would say she wanted to serve the poorest of the poor and they would let her in. But when she asked permission to enter China, Mother Teresa gave a different answer. She laid her cards on the table and proclaimed, “I want to establish the kingship of Jesus Christ through the Immaculate Heart of Mary by serving the poorest of the poor,” she said. Mother Teresa told me that the premier of China, in response to what she had said, blew smoke from his cigarette into her face. He knew that she wanted to come and establish the reign of Jesus Christ. She was refused entrance. Her response was, “So be it, but the seed has been planted.” It was the desire of her life to get into China. For years, Mother Teresa invited me to give retreats to her sisters throughout the world. I still conduct those retreats for her sisters. I know that Mother Teresa’s dream to establish the reign of Jesus in China and all over the world is still alive in the Sisters of Charity. There are sisters who speak Chinese and hope that soon, they will be able to bring Christ to China. Wherever they go, they go to establish the reign of Jesus, through the heart of his Immaculate Mother by serving the poorest of the poor. I see Father Mateo Crawley-Boevey’s dream, like Mother Teresa’s, as a command to establish Jesus as Lord of Lords and King of Kings. Through my own ministry, I realize that only a small part of the world is really evangelized to Christ. Much of the world is still not directed by Christian values. But Jesus is the King of Kings and Lord of Lords. His dominion goes infinitely beyond a plastic Jesus on my car dashboard or in my home. A careful look at the makeup of our societies indicates that in the marketplace, however, Jesus is not the Lord. People accept other forces as more powerful. Jesus wants to be the king of civilization itself — king of all meetings, encounters, sports events… everything. We need to make Jesus the power. It is essential to understand that our fire is the blazing Heart of Jesus through which we will be filled with the Holy Spirit—the ultimate power. We have the truth but we are not on fire with it. We need to change that. We cannot minimize the fire that is coming against us. Thus far, we have been like a group of Cub Scouts on a jamboree instead of forces in the battle of the Woman and the Dragon referred to in chapter 12 of Revelations in the Bible. During the early Church there was warfare against Christians but the forces for love ultimately conquered. It conquered then and it can conquer now but we need the same kind of apostles today—filled with the fire of divine love. As long as I have the love of Jesus in my heart, even if someone should kill me they will not be able to stop that love from coming back to them. The civilization of love can permeate even Wall Street. People can unite in prayer to bless the workplace and make Jesus Christ, King over them. The civilization of love will drive out the evil that has infiltrated and in some cases, dominated. Once we turn on the love of Jesus, the cockroaches scatter. Because of our brokenness, in our society, we need prisons, but even in prison, Jesus is present. We are called to bring Jesus to the prisoners too: “I was in prison and you visited me.” (Mat 25:36). Yes, we must have prisons, but Jesus in the prison can bring about a civilization of love even there, when and if we apply the laws of love. In my own ministry, I gave retreats in prisons for thirteen years and experienced God’s divine love for prisoners. I still love responding to occasion opportunities to go to prisons. I have enthroned Jesus in prison and given an image of the heart of Jesus to every prisoner to take to his cell. I have seen amazing transformations. Every institution needs to be transformed, judicial, nursing homes, mental institutions, schools, Yankee Stadium, the Coliseum — the whole of society needs to experience the civilization of love. Nothing should be excluded because all of humanity longs for God’s love. When we choose something less, we become broken. When my heart does not choose the more for which it was made, it is not satisfied; there is always something lacking. The words of St. Augustine explain this: “Our hearts are made for you, oh Lord, and they shall not rest until they rest in you.” Every human heart was made for Jesus and his civilization of love. Monsignor John Esseff is a retired exorcist for the Diocese of Scranton, Pennsylvania. He was a confessor and retreat director for Mother Teresa of Calcutta and many of her sisters around the globe. Currently he travels the world leading retreats for religious and teaching bishops and priests about exorcism.